It was dangling from the dog's mouth. That's always the way, isn't it? From plaything to mongrel's snack in a heartbeat. The arms seem to have become twisted in some horrifying way. The double amputation seems heartless. The clothing and the over-emphasized chest made me think of this woman. If you look closely enough at the photo, you can see part of her lower extremities are missing as well. Yaxeni Oriquen, looking good! But no, it's not that woman. Sadly for daughter Sammy, it's one of these. 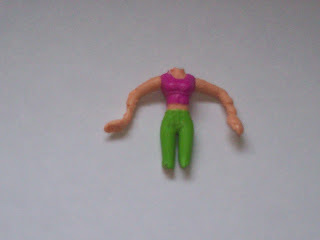 Poor Polly Pocket. Well, at least she still has pockets. She's just lacking a head for math.